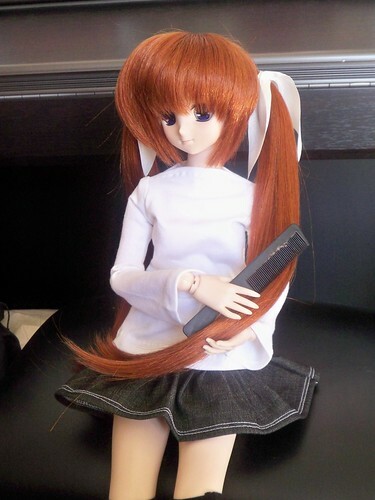 Today, I would like to introduce my Dollfie Musume to the world. In order to do so I will use dannychoo.com's Miss Dollfie Summer contest questionnaire to start things off. 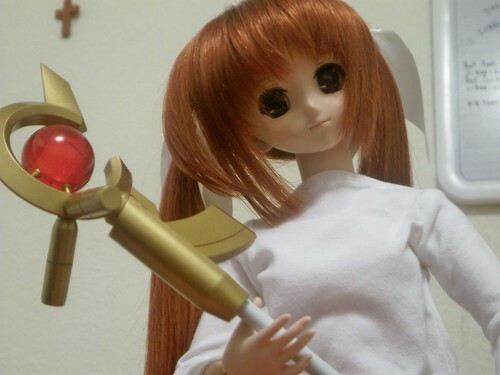 Nanoha is a lovely 19 year old White Devil/Gundam magical girl. 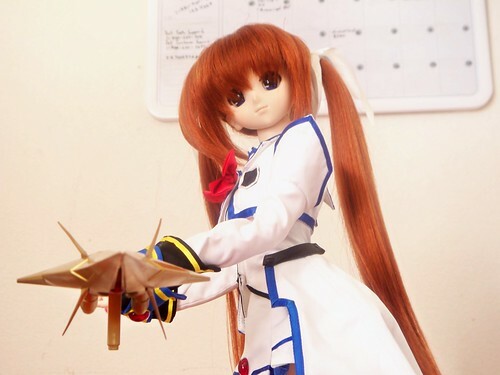 Since Nanoha has been basically a Gundam in loli form since she was a kid she developed an interest in the Gundam franchise. Anyone recognize that Gundam or the show it is from. If remember correctly is what got Danny Choo into Gundam. 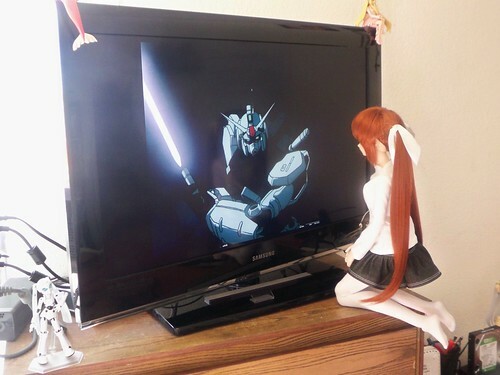 Hmm...I always tell Nanoha she watches TV to close. 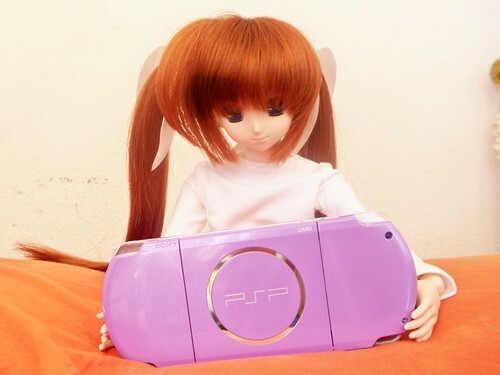 Ever since I got her a PSP she been putting hundreds of hours into Monster Hunter. Good daughter, she plays with her papa too. Nanoha likes to use the gunlance, she says it's a little like Raising Heart. I use a great sword if you are curious. She also likes to "play" with Fate quite a bit. Hmm... what were her first words? Ah! Yes how could I forget them. She didn't take to well to me seeing her naked. Not my fault, blame Volks for sending her naked to me and not dressing her up. Oh well at least she loves me as much as Fate. Lets see, a swimsuit picture too. You can see a little peek, know which swim suit it is? I think this is the greatest swim suit ever created. Why of course, it's none other than the legendary sukumizu. Like I said greatest school swimsuit ever created in my opinion, was really glad when Hobby Search had the blue one in stock. I was able to catch her changing back to her clothes. Ah! 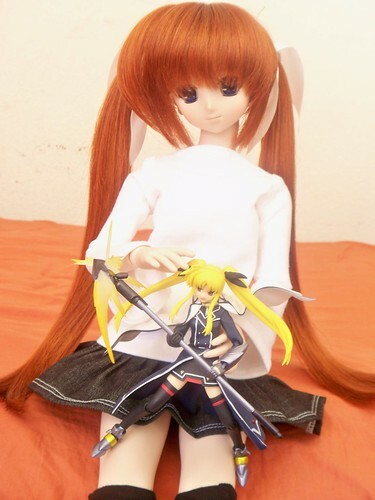 Nanoha so pretty, my friend says it's just parent's eyes. Urgh, wait, I'm about to get befriended*?! Well, there you have it, hope you liked getting to know my dollfie musume a little bit.